Myths exist in every facet of our lives. From cryptid creatures like Bigfoot haunting our Pacific Northwest, to the notion that eating before swimming increases risks of muscle cramps, myths permeate our culture. Myths even permeate the world of buildings codes. Last week, NEEP released a paper, Construction Codes in the Northeast: Myths and Realities of Energy Code Adoption and its Economic Effects, that took a look at some of the most common myths in the buildings codes world. Our report analyzed construction permit data from 2014-2017 and coupled it with data that projects the square footage of both new residential and commercial building stock for the next five years in order to create a complete picture of the economic development of the building sector and identify opportunities states have for savings and more robust energy efficiency programs. The Myth: Opponents of updated energy codes state that it will be too costly for builders, contractors, and homebuyers to adopt update energy codes. This is due to the perceived extra work, complexities, and materials needed to build to a new code. This myth persists with lack of evidence just like the story of our fictional hairy friend from Washington. Luckily, we have the facts, data, and information available to prove that updated energy codes do not halt construction starts, and can in fact show the opportunities for deep energy savings. The Reality: Energy codes are the only building codes that pay for themselves through occupant energy savings. Construction permit data tells the story of economic development, trends in building types and sizes, and trends in geographic location of construction projects by county. Using this information, NEEP shows that there is no correlation between updated energy code adoption and slowed down construction. Instead, the opposite is true. This information is useful for states, local governments, and other policymakers to target geographic centers of development for new energy efficiency initiatives, energy codes, or code compliance training programs. States can take this information and use it to inform their energy code training programs. For instance, if it is clear that commercial construction is on the rise, an energy code compliance enhancement program can be tailored to meet the needs of the commercial sector, while locating those trainings in counties with higher development rates. Projected additional square footage data has allowed us to determine the potential energy, cost, and greenhouse gas emissions savings for each state in the NEEP region to show the effectiveness of an updated energy code. The NEEP region stands to save $584,964,954.31 if every state from West Virginia to Maine updates to the latest energy code. These savings would be realized by renters, homeowners, property managers, businesses, and so many others who utilize and pay for energy. Our analysis shows that Maine has the opportunity to realize significant savings from an updated commercial and residential energy code. Currently, Maine utilizes the 2009 International Energy Conservation Code (IECC), while all other codes were updated to the 2015 I-Codes, which includes fire, mechanical, and plumbing codes, in January of this year. These codes are published in conjunction with each other and should go hand-in-hand to increase the safety and efficiency of Maine’s building stock. 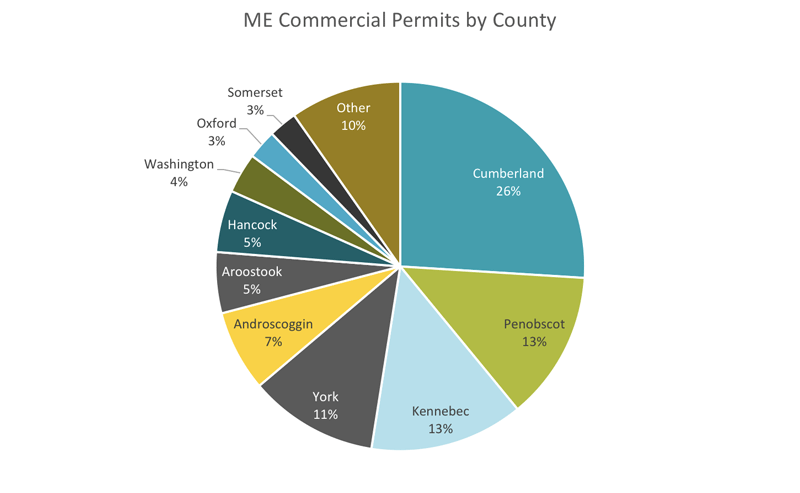 Maine’s energy code also contains an amendment that states that any community with fewer than 4,000 people does not need to comply with the energy code. An updated energy code, without the <4,000 amendment, could help Maine realize huge savings, increased comfort for building occupants, and safer buildings overall. With almost two-thirds of Maine households using fuel oil as a primary heating source, and an average January temperature high of 28 degrees Fahrenheit, the state’s residents will benefit from tighter building envelopes and more insulation that comes with an updated energy code. When designing an energy code compliance enhancement program to ensure the above-mentioned savings are realized, training is the key initiative that can help improve compliance rates. If Maine updates its energy code, a training campaign could be deployed to counties of increased building development. For example, Cumberland County contains 26 percent of all commercial building developments. Commercial energy code trainings could be targeted to this area in order to reach a maximum number of builders, architects, building officials, and energy code offices. Updating state energy codes does not contribute to any slowdowns in construction activity. An updated energy code creates opportunities for increased cost, energy, and greenhouse gas emissions savings. Increased resiliency during extreme weather events like hurricanes and superstorms.